The year is 1995. Computer technology is advancing at a rapid pace and the demand for personal computers has never been higher. Leading computers into the living spaces of millions is FlamingOS, the latest version of the number one graphical user interface that both businesses and home users choose as their computer's operating system. Even your computer is running FlamingOS! However, your computer is special. Mysterious functionality allows you to explore virtual worlds hidden within the operating system and within each world you find, every new piece of data you discover, there lies clues to one of the best kept secrets of human-kind... That's right, an ancient alien conspiracy. perfect desktop environment for finishing a workload the size of Mt. Everest in record time, with time left over to play a couple games of Go Fish! 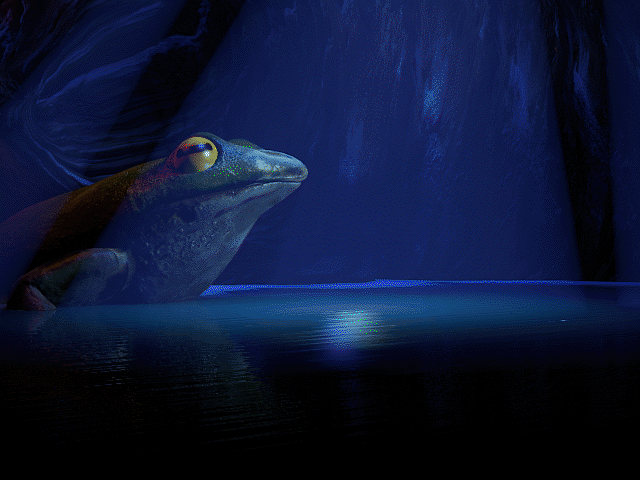 The soundtrack for Frog Days will vary from atmospheric ambient tunes to upbeat exploring tunes to contemplative puzzle tunes, not to mention all the tunes featured outside of gameplay, such as those used for the in game music player! There is also a lot of music. 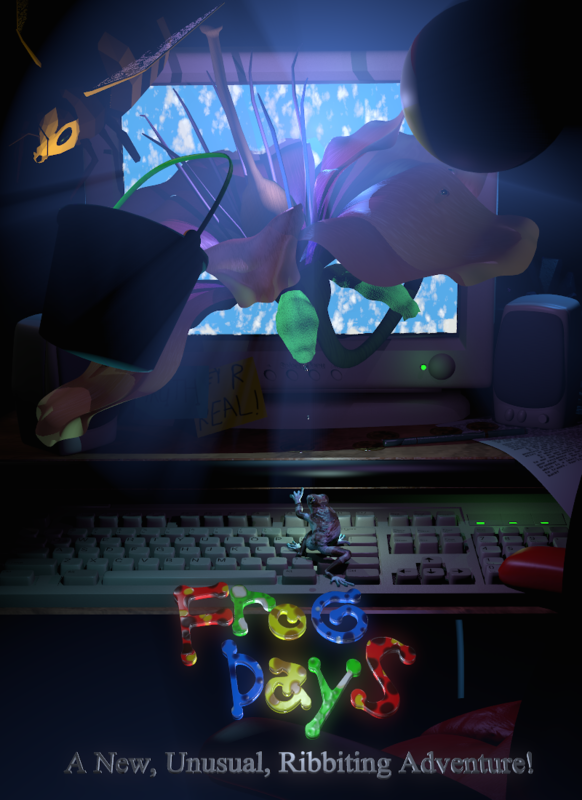 Over the years I've been working on Frog Days, I've composed over 90 songs for the first person exploration part of the game and so far about a dozen for music outside of exploration. What tools are you using to make this game? 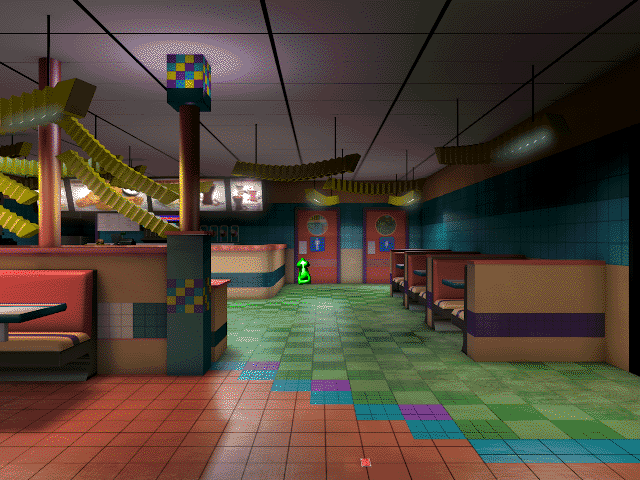 -Frog Days is running on the fantastic Adventure Game Studio Engine by Chris Jones and everyone else who helped make it a great piece of software. -All 3d graphics are created in the incredible, open-source 3d modeling juggernaut Blender, using the internal renderer. -Textures and other imagery created using Adobe Photoshop. -Music created in FL Studio 10. Nearly finished! The original scope of the game has changed since October, 2017(when this was last edited) but I'm happy with how things have shaped up and I think you will be too! Intriguing premise. There need to be more exploration games! I really like that you're going with a lot of optional content: it has the advantage of letting the player beat the game but still wonder if there are secrets left behind they missed, possibly whole worlds. Will the 'worlds' be interconnected in any way, or have worlds that only become available after you've explored others? One disappointing part of an exploration game is when you've seen everything there is to see, but still have to retread old ground to solve puzzles that won't reveal anything new. Thank you! There are entire secret worlds, yes... and some are hidden good heheh. I feel like if the content is interesting enough, then players will want to explore all they can, or look hard for the secrets, you know? Then it's not really optional content... it's discovered content. And, at least for me, the feeling of discovering things in games is the best type of feeling! 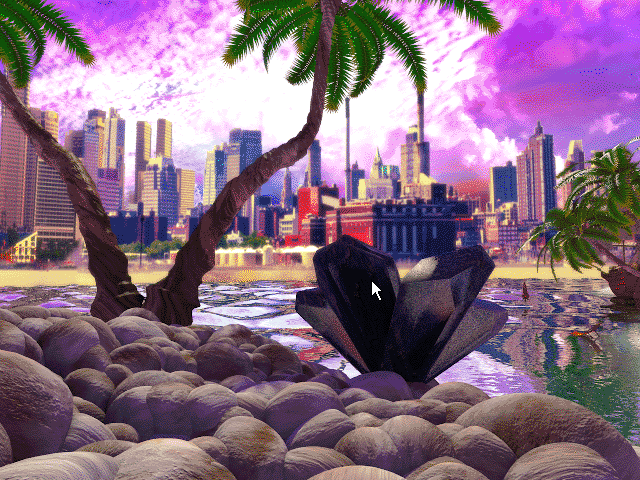 Some locations are literally connected- for example, let's say there is a picture of a coral reef on the desktop(there will be an oceanic world, but it's one of the few I haven't started production on yet). 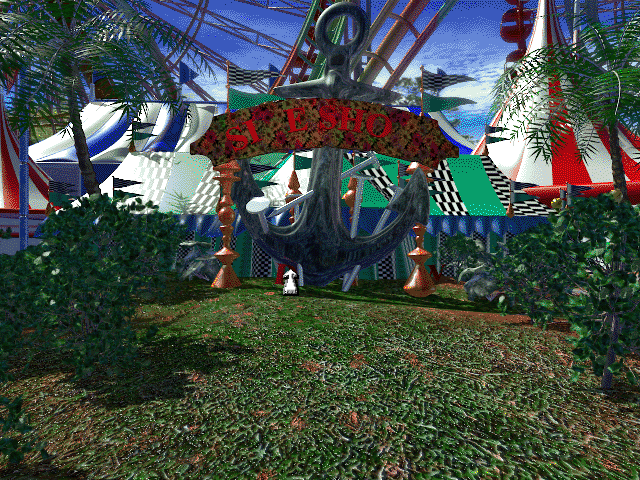 You can enter the coral reef world by opening the picture and clicking on the picture once more, like all image-file worlds. However- there are other parts to this world you can only access by entering via a different file. Some locations might only be accessible if you do something in the game's computer. 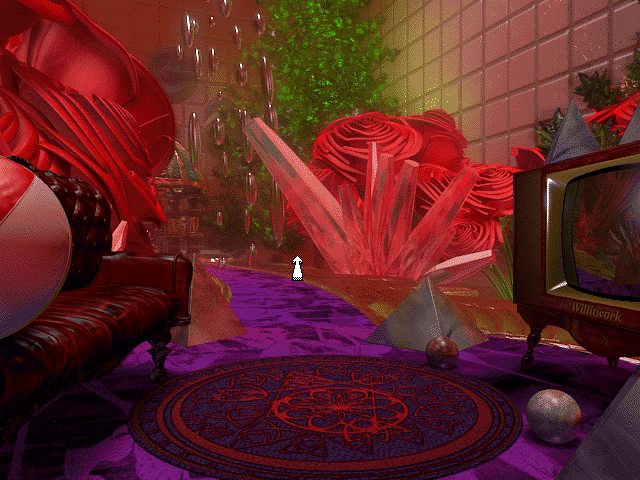 Some locations you have to solve a puzzle in another world to explore it fully. The first update! If nothing disastrous happens, I should be updating at least every 2 days. Not much in the ways of visuals to show. This was a weird time to start the devlog because I'm coming off of about a month of heavy duty crunching to get promotional material done. Now, it's heavy duty crunching on completing the functionality of the game's operating system, FlamingOS! It's been about 8 months since I've touched the actual game. Within those 8 months, I've become a competent 3d modeler. But have I forgotten how to program? Thankfully, not really. The one class at community college I enjoyed and learned A LOT from was Progamming Logic, and I still remember most of it. And my organizational skills have gotten much better. I'm not going to lie- what I wrote long ago is a bit messy. Thankfully, not bad enough to start over. Just touch up as I go along. Before, I only had dragging icons and right click menus done. But, over the last couple of days, I've completed a working clock, dragging application menus, screen saver code, and I wrote code for custom scroll bars. So you interact with it exactly like you'd expect a scroll bar in your browser or OS of choice to work. Beside that, I lopped off some old code, simplified some things, some other behind-the-scenes kind of stuff. Btw, I'm posting the album versions here. In the game, the music will sound more era-appropriate. So muffled, fuzzy, and degraded heheh! I'll have more visual content to show soon! Thanks to guidebookgallery for the pictures. I don't think one looks better than the other, it's like comparing Apples and Oranges. It's missing a lot of stuff, such a file browser window and tabs at the top, but it's beginning to come together. 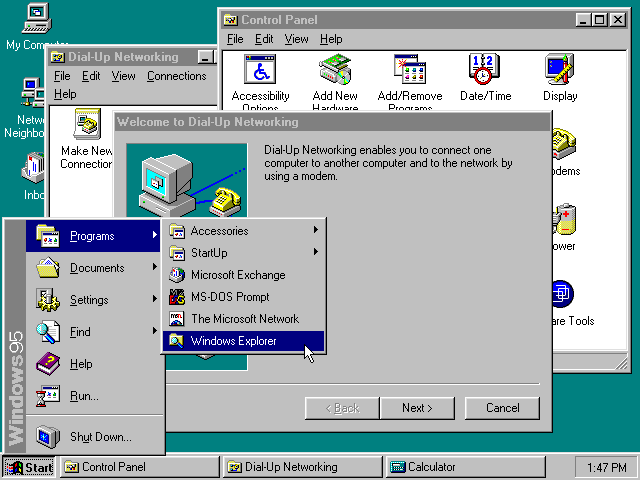 To stay true to the design of many 90s/early 2000 applications that I recall from my childhood, I made sure the buttons are in complete contrast and color and style to other elements of the program. Oh I almost forgot! 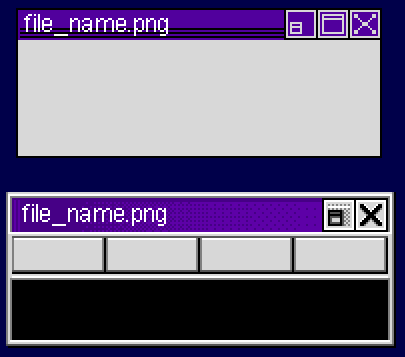 The OS will also have plenty of other music that it comes with, like those horrible midis Windows 95 came with. 20% chance of being frog fractions 2? 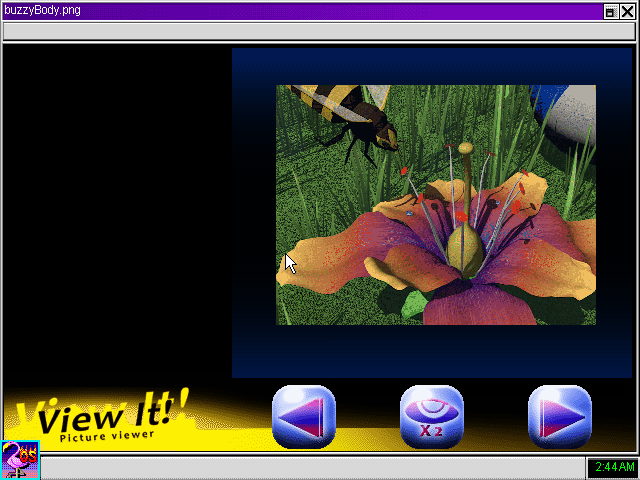 haha those are some very 90s graphics. I like it. By the way, where else did you post those watermelons image? I've seen them before but I don't know where from. No Unfortunately this has nothing to do with Frog Fractions 2, I swear! 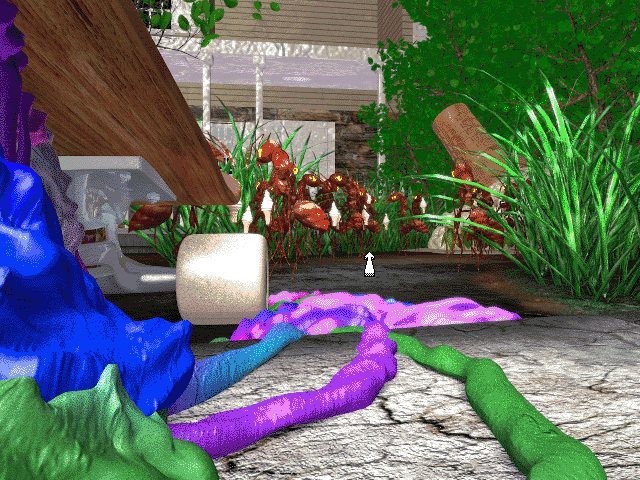 I think if your looking to satisfy your craving for 64 color virtual amphibians, Frog Days will do just fine. 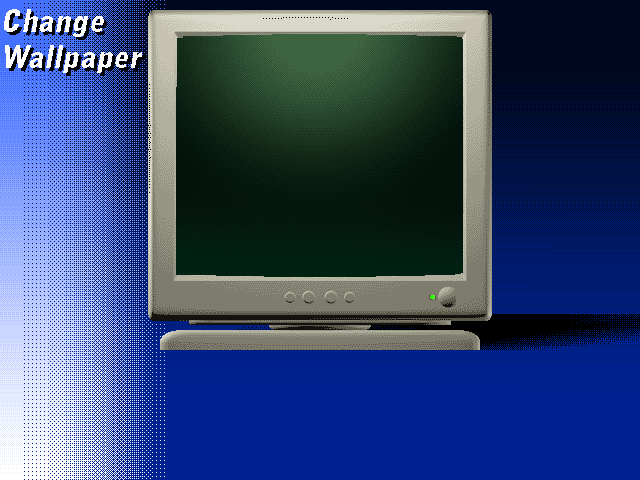 Quick update, yesterday I wrote the dragging/double clicking room objects code for the wallpaper changer screen. I could have copied the code from another room script, but the code is very dirty and references objects by script names rather than ID, and for some reason I gave them text properties and it's just a mess... It works, but it's a mess. So I just decided to try writing something shorter and more organized. Clicking and dragging is kind of like breathing or blink to use. We do it and don't really think about it, or how it works... it just is. But in order to understand how to program dragging or double clicking, it's important to break down the process. left-click --> is mouse on something? No? Then do nothing. left-click --> is mouse on something? Is the left mouse button down, and is the mouse moving? Then drag whatever the mouse last clicked on the mouse. left-click --> is mouse on something? Is the left mouse button down? Oh it's up now? Get me in a couple cycles. Is the mouse clicked again? No? Then do nothing. left-click --> is mouse on something? Is the left mouse button down? Oh it's up now? Get me in a couple cycles. Is the mouse clicked again? Yes? 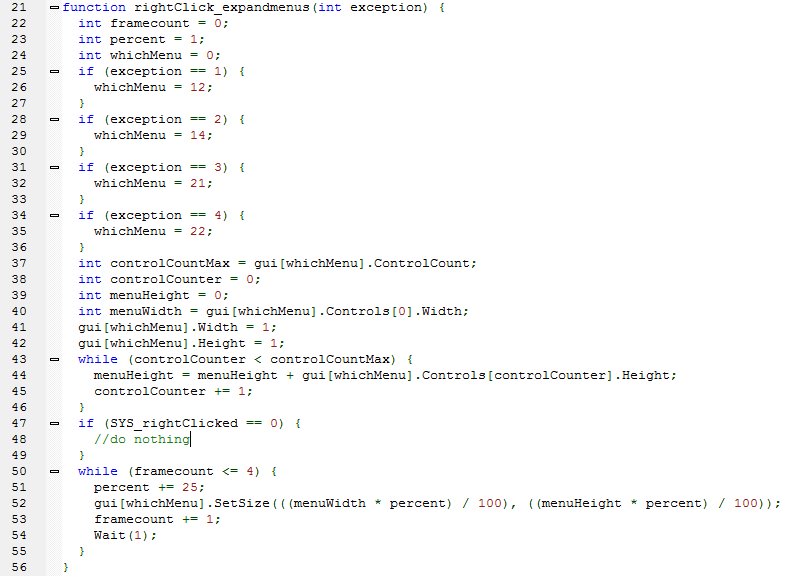 Then open up a menu, or change a variable, or whatever. Sets the desired object to the mouse's position at an offset, the offset being where on the object's graphic you clicked. Keeps track of tracker variables. There's no way to tell the game to wait without pausing everything, so you need to set up variables that increment every cycle to keep track of intervals between clicking. Otherwise, double clicking won't work! All the conditions necessary for double clicking are here. The tracker variable needs to be more than 1, but less than 19. This gives about half a second to click again to register a double click, though the number can be adjusted to taste. 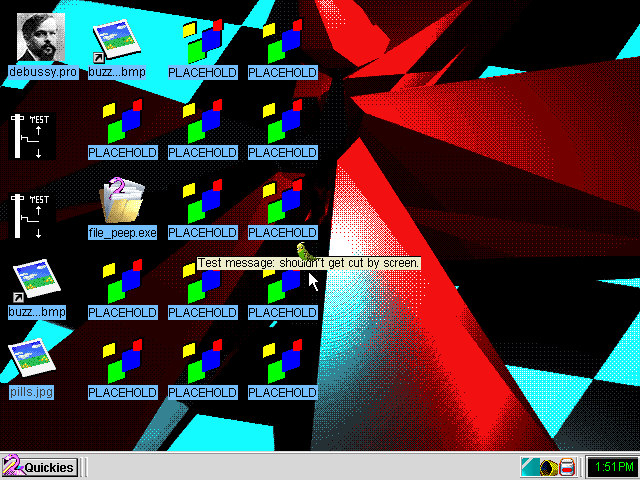 Then, it sets the current wallpaper to whatever the object ID is that you clicked on. This script runs every cycle, so it constantly checks to see if your dragging or clicking, and it also calls the tracker function so that time tracking actually happens. It's important to place some kind of variable to switch on after processing a click at the mouse's position, other wise it screws up the dragging offset. The offset only needs to be calculated once per click, not continuously! After it switches the variable to 1, it will call the dragging function no matter what while the mouse is down, and only drag to the thing you clicked on last. And finally, the this function is what sets the offset variables. 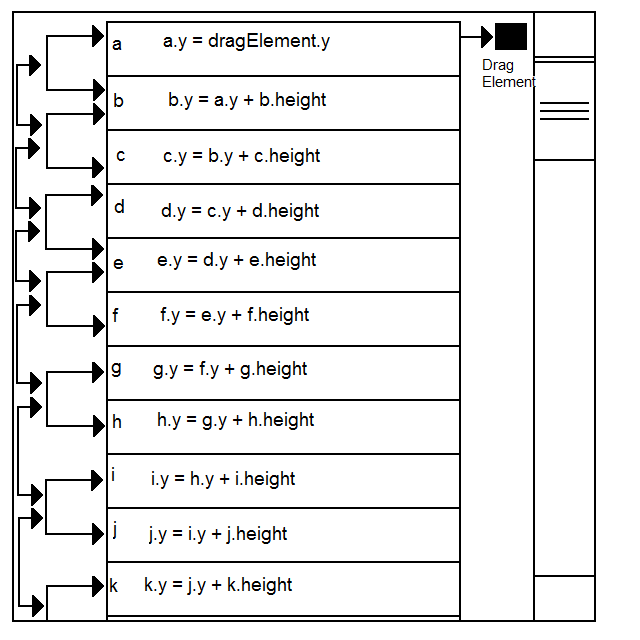 It also calls dragpapers to prime the dragging process, and leftclick_func so that it detects if you double clicked or single clicked. 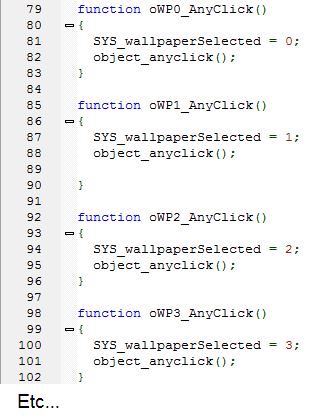 Then, a function is to be made for every instance of a wallpaper object. There will probably be a total of 15 wallpapers in the game, but I can easily add more. This isn't the ideal way of doing things, but I couldn't for the life of me figure out how to get the game to return the ID of what object it clicked on, so I had to make it so each object tells the game what it's ID is. I made it as simple as possible though by condensing repeated code into the object_anyclick function and using a global variable to tell it what's selected. 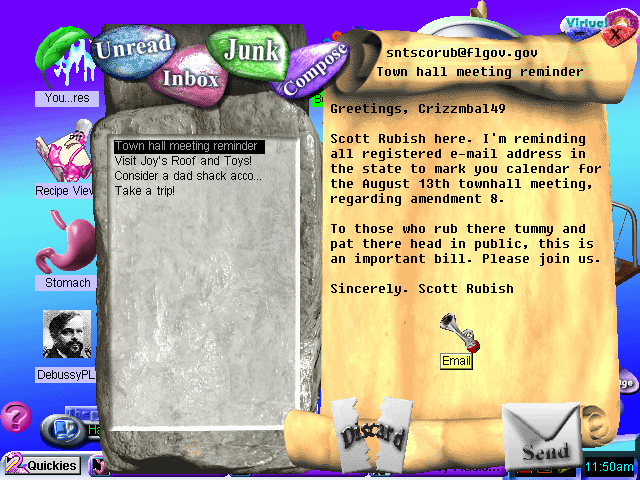 I don't know, I just feel like we take the spiffy GUI interactions we have now for granted... I never thought twice about clicking or scrolling or double clicking until working on this kind of stuff. I have a new found appreciation for it. Next time, I'll post more images of the wallpaper manager. 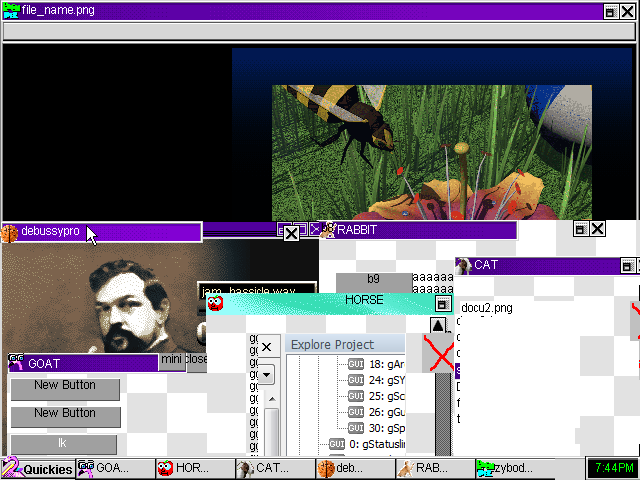 At the moment, it's just the screen shot shown earlier with a bunch of ugly place holder sprites you can click on. Nothing impressive. Ah, it might have been the 3d thread! I go there frequently. This whole melon talk would look super weird without the context "nice melons! they look familiar though"
I like technical stuff on devlogs. Most people use their threads to showcase progress only, which is fine, but the best ones are actual development logs, with their development problems and solutions exposed. Regardless of their nature, design, artistic, technical etc. Once again, I'm looking forward to returning to making real game assets, but this operating system portion needs to get done... The irony is programming special stuff for actually playing the bulk of the game was rather easy. 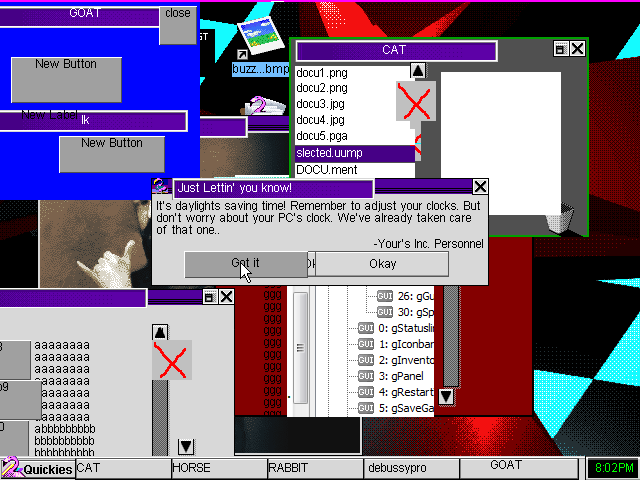 But the operating system(which is basically a menu-ified overworld!) has been quite a challenge thus far. It's ugly right now, but as I said, the big focus here is getting things working properly. It's still very rough around the edges however! But as you can see, there are multiple scrolling windows on screen at once, and they only effect elements of their own window. One of the problems with modularizing and parameterizing everything is if the engine your working in can't do instancing of objects, you need to be specific about what your trying to do. Oops! Wrong kind of PCLSS! However, those do look tasty. Thanks to Voglia of Wikimedia commons for supplying us with pickles. So basically Current.y = Previous.y + Current.height. This could work for any number of buttons, labels, whatever, but since the maximum in adventure game studio is 30, and since my system requires controls 0-7 to be specific things, controls 8-30 can be PCL'ed. 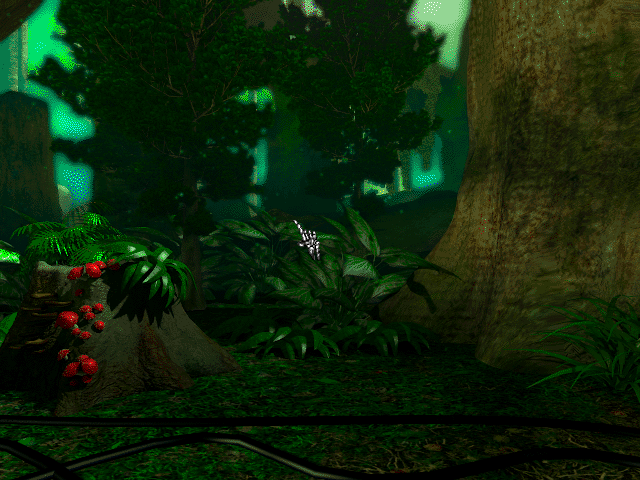 MYST meets desktop simulator. 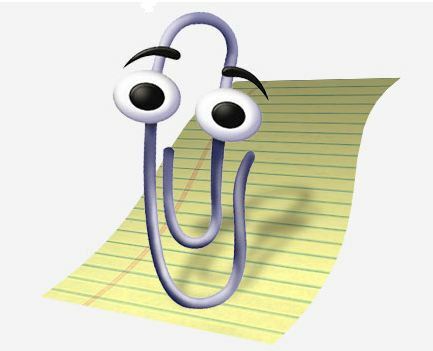 I just hope you implement some kind of hugely annoying but inevitably helpful desktop assistant. What is it you are building the game with? You mentioned Adventure Game Studio but I can't tell if that is a framework you have made or..? Pretty much, yes! I've never played desktop simulator, however there is indeed a desktop simulation with Mysty gameplay. And it wouldn't be a desktop without the annoying desktop assistant, now would it! XD there will be at least one, though I plan on having multiple annoying assistants for different types of documents or something... that's something I've not really fleshed out yet. Oh and I didn't make Adventure Game Studio! I take no credit for that, it's all the work of the wonderfully generous and kind Chris Jones and the great AGS community. I'm merely bending it to do what I want it to heheh! I will update the first post to eliminate confusion. 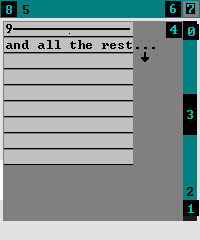 First, the game gets which menu is expanding, determined by the exception. There are 4 different right click menus now, each for different file types, but there might end up being more. Once whichMenu is determined, it gets how many buttons(or controls) are in the GUI, which will be the maximum height. The width is taken from one of the control's width. Each one is the same, so the width is simple to get. Now that the height/width is set, it's a matter of using a simple loop that increments a counter and increase the values based on percentage! This way expanding menus is scaleable- meaning I can have a right click menu 10 pixels or 300 pixels high and wide and it'll expande nicely over the course of 4 frames. 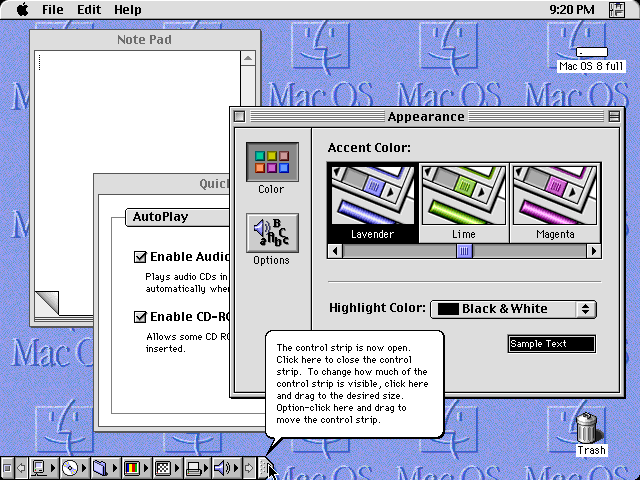 Second, the StartQuickies tray displays buttons indicating what is open and not. Clicking on a button brings that window to the front above the others. Close one gets rid of a button. It works similarly to a real OS. Right now the names are place holders, so I can easily distinguish what is what. This is just too retro. An update on the Quickies tray- so in the last post the buttons only displayed program names. Now, they do much more! 3. Shows the header icon of each application that's open. Now, you may notice some cutting off of the button farthest to the right- that's just temporary. I originally was going to use different sets of button graphics for smaller sizes, but I might be able to do a little trickery to get around that heheh...! 9+++ all other buttons that scroll to the dragging element. It seems as if nothing broke in the process... I'm trying things out as you read this, rigorously trying to break the system! 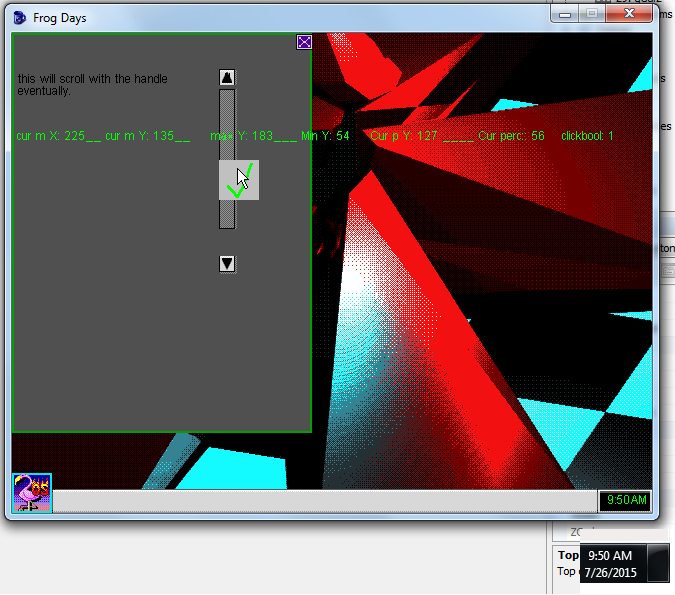 Other features I've added is shrinking and expanding tray buttons and program windows. I feel as if things are really beginning to come together! -Info windows that appear when your mouse is over something for a set amount of time. 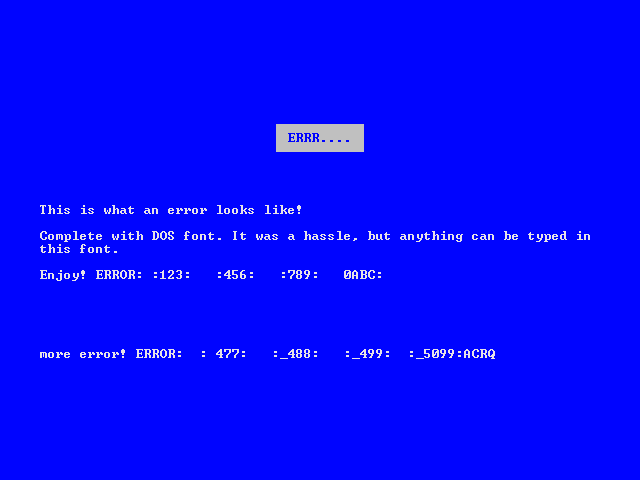 The idea that BSOD is a feature makes me weep with paranoia and joy. Don't worry, it won't break the game... maybe! -Added mouse helper text. But there's no system to tell the game what text should be displayed yet. But that won't be very hard to implement. -Game saves which menus are minimized or not, so when you from settings manager, wallpaper manager, screensaver, etc... it brings up the saved menus. Also created a bunch more icons, but they're all place holders for now. I haven't really 100% decided what file icons will look like yet. And which ones that will be on the desktop aren't 100% final either. However, about half will be accessible via shortcut. FlamingOS Project Manager: "We let our UI intern design this one..."
I've decided to take a break from working on programming the operating system portion of the game, to work on the actual "game" part of Frog Days. So... who wants a donut? If you're a fan of donuts like I am, then you probably want a donut as you read this. 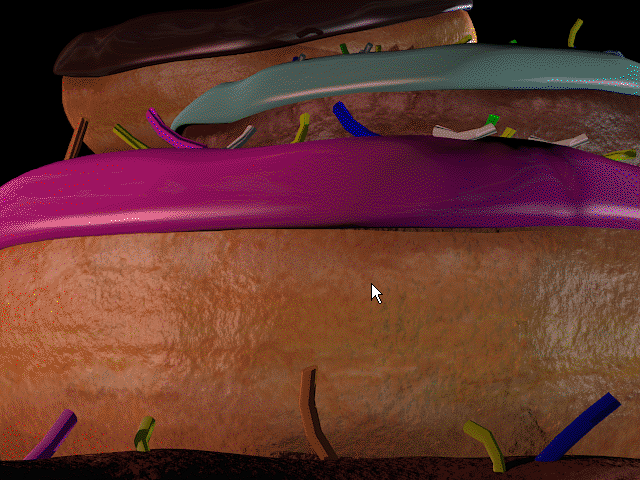 Well, hopefully these virtual donuts can satiate your new-found craving! That's basically it for now... I've not made a lot of content, still a bit rusty. 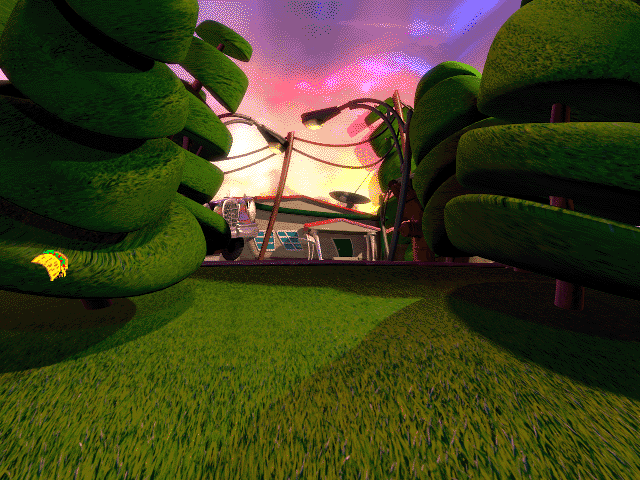 But, I'm getting back into it and I think now my vision of how the game's locations should be like has been refreshed. 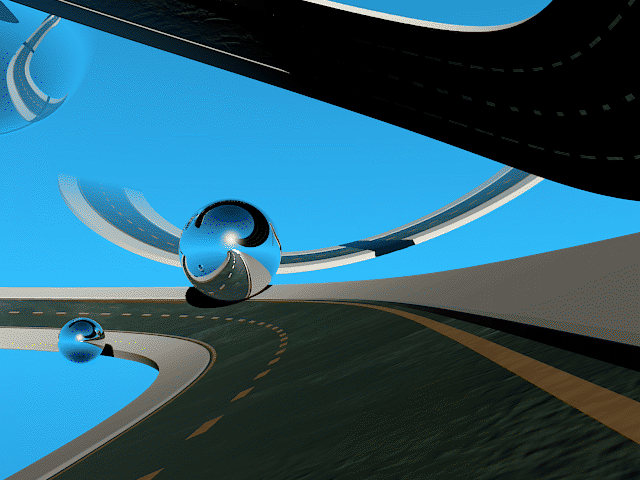 At one point, I lost site of what I wanted to do- create dreamy places to explore(with an underlying connection to the... well, that's a bit of spoiler!) 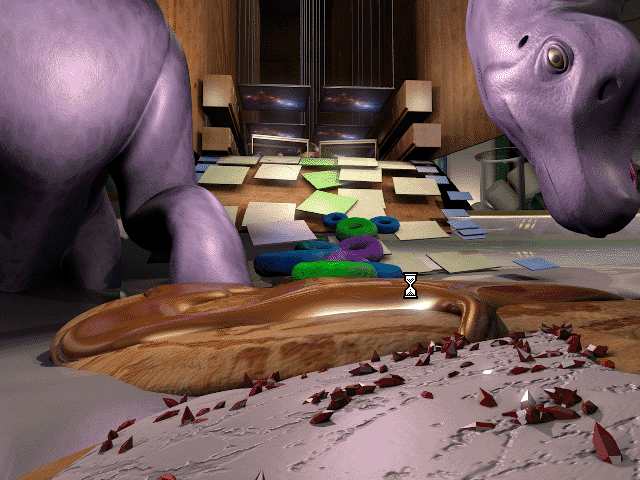 but that dreamy, surreal, mid-90s style CG look kind of became more tame and modern. Not everything will look beautifully textured and exquisitely modeled- partially because well I'm not an expert on 3d stuff yet! But because it was that imperfect, adolescent fumbling with 3d that gave games a certain charm. This brings me back to the days of being a little kid fascinated by Windows just in and of itself. I'm really curious what debussy.pro is.